Document Node simplifies the process from writing to publishing. Unlike all existing solutions available on the market, Document Node allows you to concentrate on your content from the beginning, and get a beautiful website, as well as other formats like PDF or eBook etc., automatically from your plaintext folder. Note: The Alpha version of Document Node is only available to early backers. Please subscribe to our newsletter to get notified when it's ready to download directly. Installing Document Node is easy on all platforms. It follows the installation standard of the underlying operating system. On macOS, once you have downloaded the DMG file, double-click on it. 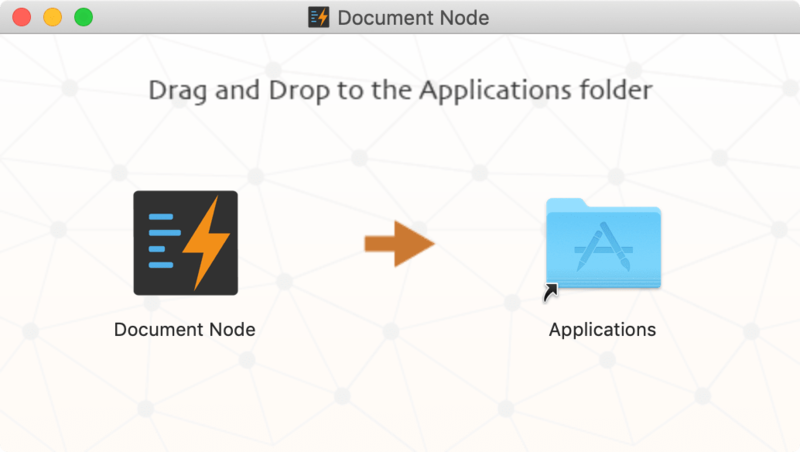 And then, drag and drop Document Node to the /Applicatoins folder. For Windows, we have provided an MSI installer, which will guide you to install Document Node step by step. You can also use the portable version, which is a ZIP file. After you've downloaded it, unpack the application folder to any location of your disk. And then double-click Document Node.exe to launch the application. For Linux platforms, Document Node is packaged as an AppImage, which means Linux users can download the AppImage and run it directly on their desktop system just like we would do with a Windows or Mac application. No need to install. No system libraries or system preferences are altered. 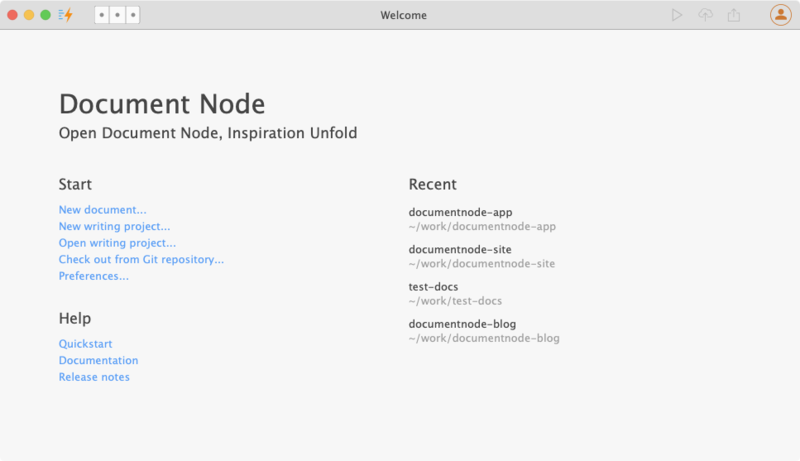 When the first time you've launched Document Node, you will see a welcome page, where you can create a document, create a new project, or open an existing project directly. We are trying hard not to invent any new terminologies so that users can start benefiting from the software quickly. Perhaps project is the only terminology you need to understand at the moment. But it will be straightforward. A project in Document Node is just an ordinary folder on your disk, where you put your plaintext content in. You can organise your plaintext files into different folders for different purposes. For example, one folder for your company website, the other folder for your new book. In Document Node, we call such top-level content folders projects. When creating a new document with no project specified, the default project at ~/My Writings will be used. Once you finish your writing, click the Run button on the top right corner, you will get a website with all default settings automatically. There are three modes you can use to customise your pages. In Designing mode, you will be able to add/remove/change page blocks. In Editing mode, you can change page text via inline-editing, and change text links, images and so on in popups. In Styling mode, you can modify colour, size, and background of page elements. If no mode is selected, you can navigate the website in the usual way, which means clicking a link will direct you to a different page. As we keep adding new features into the product and fixing bugs frequently, it's essential that users can get the latest version as soon as possible. For now, auto-update has been fully supported on macOS version and Windows version. To check updates, on macOS go to the Document Node application menu, and select Check for Updates..., on Windows, choose Help -> Check for Updates... menu. No auto-update for Linux users at the moment. Please subscribe to our newsletter and download the latest portable AppImage when it's available.